According to ‘EOS’ logics, Canon is preparing to launch another DSLR camera namely the Canon EOS-1Ds Mark IV. Although it’s not officially announced, the camera is said to be the successor of Canon EOS-1Ds Mark III and will feature a 30+ megapixel image sensor. The camera itself is expected to make its debut at Photokina 2010. Stay tuned for more updates. Lumenera has rolled out two new industrial color cameras in the form of the Lw110 and Lw115 (pictured above). Designed specifically for industrial applications, these USB 2.0 cameras boast a 1.3-megapixel color image sensor running at up to 60fps, an onboard processing system for delivering outstanding image details and have the ability to record high resolution 1280 x 1024 video at 30fps. These cameras are available in two different versions, either enclosed (Lw115) or board-level (Lw110), allowing for either off-the-shelf purchasing or OEM customization capabilities. 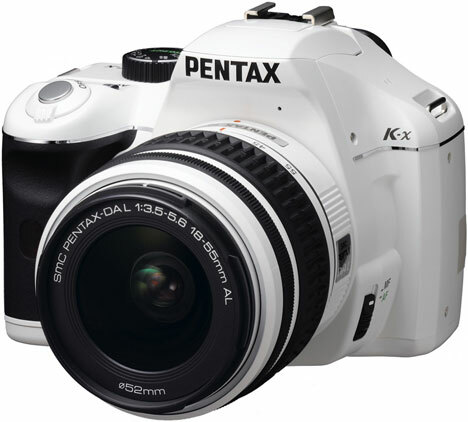 Pentax's K-x has been shipping in various corners of the globe (in various hues) for a hot minute now, but at long last the entry-level DSLR has found itself on the test bench. The good folks over at Tech Radar were able to take the $650 shooter for a spin, and with few exceptions, they absolutely adored it. Image quality was deemed fantastic, and without qualification, that's easily the most important aspect of a camera. Critics also appreciated the build quality, rear LCD and ergonomics, though they did note that the 720p movie mode was 'hit and miss.' They found it to be a good fit for novices and amateurs, and while they did feel that it was somewhat less comfortable to wield than Nikon's D5000, they still maintained that it'll be a great bargain when the street price falls just a bit. Tap the read link for the full skinny -- but only if you feel compelled. The DVR 150 is the latest camcorder from Vivitar that is waterproof up to 5 meters underwater. The cool factor for this video recorder is that it also has an infrared night vision mode to capture video in the dark environtment. Available in violet, pink, blue and black, the Vivitar DVR 150 has a 1.8-inch LCD screen, a webcam mode, a 8X digital zoom, a TV out, a 2GB of built-in memory which is expandable via an SD slot, and a USB port. The Vivitar DVR 510 is priced at $49.99. It can't be easy being the cost-cutter in a game as insanely expensive as digital medium format cameras, but after teaming up with Phase One for a $5990 medium format shooter (without lens), Mamiya is taking its own crack at the market with the $9,995 DM22. 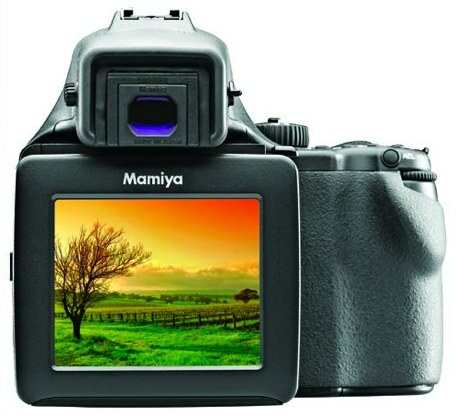 It comes with a Mamiya 80mm f/2.8 D Series lens, has a 22 megapixel sensor and can pump images straight out over FireWire if you think your RAW files are too good for a lowly CompactFlash card. It's also being introduced with a $14,990 sibling, the DM28, which has a 28 megapixel sensor and handles higher ISO shots. 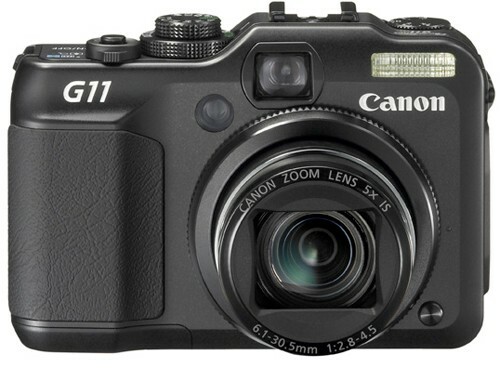 We had an all too brief hands-on with Canon's PowerShot G11 way back in August, but the first real flood of reviews has only just recently started, and now seemed like as good a time as any to get you caught up on some of them. As you might expect, one of the real stand-out features is that swiveling LCD, which is not only good in and of itself, but 'one of the best of its type' according to What Digital Camera. Other reviewers like Wired UK and CNET UK also found that G11 delivered some noticeably better results than the previous G10, with it aided especially by the surprising but welcome shift from the old 14.7-megapixel sensor to a new 10-megapixel one that offers an improved dynamic range and better performance at high ISO settings, among other advantages. On the downside, the camera is somewhat bulky, and PhotographyBlog says it fails to live up to Canon's claims of it being the 'ultimate compact,' especially when you consider some of the similarly-sized (but admittedly pricier) Micro Four Thirds offerings available. 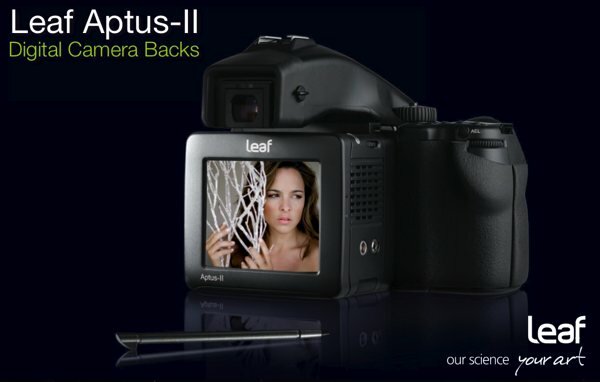 Neither for the faint of heart nor the slight of credit, Leaf's newest -- the Aptus-II 5 digital back -- boasts a 0.9 fps capture rate, 22 megapixel sensor, 2.5-inch touchscreen display, a 12-stop dynamic range and a 25-400 ISO range. Sounds great, right? What if we told you it would run you €5,995 (about $9,000) for the back itself, or you could bundle it with the Phase One 645AF body and an 80mm lens for €7,995 (about $12,000)? Right, you'll take two. Pre-order now from your favorite Leaf Imaging retailer and you should get your new device in November. PR after the break. Apple’s official release of the new iPhone 3.0 software came a number of new graphic elements. the iPhone GUI PSD holding off updating the Photoshop file, Apple’s SDK is amazing, but when we need to mock up something quickly for a pitch we turn to this. US soft drink giant PepsiCo has apologized for a free iPhone application crafted to help men seduce women and keep records of conquests but the program remained available on Tuesday. Pepsi's "AMP Up Before You Score" iPhone application categorizes women into 24 types and then uses the Apple smartphone's Internet capabilities to link users to information about them and what they like. AMP is an energy drink made by PepsiCo. "Let's say you meet a girl who is way into being green and you need a vegan restaurant stat; we've got you covered," a voice-over maintained on Tuesday in an online Pepsi video about the AMP at YouTube. "If you are anticipating a successful night, the Before You Score app gives you up to the minute information, feeds, lines and much more to help you amp up and talk to 24 different types of ladies." Types of women listed in the application include punk rocker, bookworm, aspiring actress, artist, and sorority girl. Apple plays what its CEO Steve Jobs once likened to a game of "cat and mouse" with iPhone unlockers and jailbreakers. Jailbreakers, like the iPhone Dev Team, try to release the iPhone from being limited to the official iTunes app store and other firmware restrictions, while unlockers, such as George Hotz, use the jailbreaks and other techniques to unlock the phone, allowing it to run on any hardware-supported network. Usually the unlockers/jailbreakers seize the day, but occasionally Apple will win a round. Apple has tried many approaches -- everything from "bricking" unlocked iPhones to denying jailbroken iPhones access to the iTunes store -- to halt the spread of unlocking in the U.S. and force people to use AT&T, despite the hardware being capable of working on other carriers such as T-Mobile. Now, Apple has managed to gain an upper hand over the persistent hackers according to iClarified, thanks to the release of a new bootrom, iBoot-359.3.2. The phone firmware, which shipped on new iPhone 3GSs starting this week, closes previously used doors to exploits. The National Film Board of Canada is launching a new iPhone application that allows free viewing of hundreds of documentaries, animated films and trailers. Users can stream a video as they watch it or temporarily store it on the iPhone, to be played back at any time up to 24 hours later. The full list of videos is available at NFB.ca, where the films can also be viewed. The NFB's was founded in 1939 and has since created over 13,000 productions and won over 5,000 awards, including 12 Oscars and more than 90 Genies. Competitor after competitor have launched their own app stores, but none have been able to come close to matching Apple's industry-leading iTunes App Store, which serves the company's popular iPhone smartphone. The App Store has suffered a bit in the past from controversy, though, with many developers unhappy with Apple's inconsistent approach to application acceptance. Now, with Apple trying to put that controversy in rear view, a new one is brewing. Recently, there has been a growing user outcry, particularly in the influential business user segment, over Apple's no-refunds policy concerning App Store downloads. With some apps like GPS applications or business applications coming in at $30, $50, or even more, users are becoming furious when these pricey apps occasionally fail or prove to be bug prone. With no returns, these users are out of luck, with Apple leaving them no recourse. Apple's policy explicitly states -- refunds will only be offered if the download fails. These complaints have been given a prominent voice by a recent piece from Eric A. Taub of The New York Times. Mr. Taub writes, "None of this may matter if the most expensive app you’ve downloaded is a 99-cent virtual beer glass. Once the novelty wears off, most people can live with the financial loss. But asking people to spend $100 on an app that they haven’t had the opportunity to try and can’t return may limit its popularity. Even if you don’t return a piece of consumer hardware you purchased, you can always try to sell it to someone else. But an unwanted app remains yours forever." 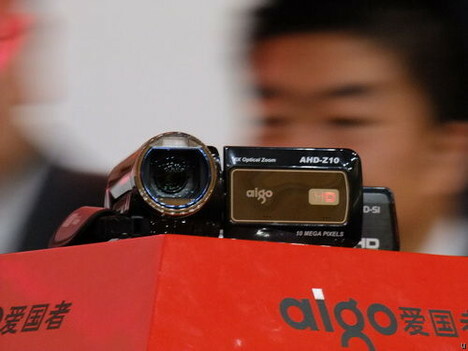 Aigo has unveiled a couple of full HD camcorders in the form of the AHD-Z10 and the AHD-S1, where both models are tipped to hit the market before the year is over without breaking the $500 price point. Both models will boast the ability to record 1080p videos in H.264 encoding, featuring a 10-megapixel sensor, a 3' touchscreen LCD display, HDMI input and optical zoom lens. Sounds like quite the device to get for those on a tight budget who doesn't really take brand names into consideration, eh? At first glance, that seems like a lot. Yet Sony could’ve done a little better with the bundle, including a Memory Stick and a basic camera case at the very least. I totally understand Sony wants customers to spend more on accessories (the included catalog makes this marketing push very obvious). But what’s wrong with whetting the new owner’s appetite right away? A 1GB memory stick provides enough capacity for decent use, while a cheap camera case would provide basic protection for the TX1’s stylish (and fingerprint-vulnerable) exterior? In any case, watch out for updates as we put this camera through its paces. If you’re eager to own a Sony Cybershot TX1, B & H is selling this baby for $380. Available range from feminine pink to the understated gray. Sony has unveiled the pricing and availability of their new XDCAM EX Shoulder-mount camcorder, the PMW-350K. The Sony XDCAM EX PMW-350K provides three 2/3 inch-type Exmor Full HD CMOS sensors, an HDMI out, and a 3.5-inch LCD screen. The PMW-350K is able to record video in MPEG-2 Long GOP HQ, MPEG-2 MP@HL SP, MPEG-2 MP@H14 SD mode on a 32GB SxS memory card. Measuring 124mm x 269mm x 332mm and weighing 3.2-kg, the Sony PMW-350K will be available on January 10th, 2009. One day after having been leaked to the wilds and then officially announced, Nikon has opened the floodgates on the upcoming D3S, an upgrade to last year's D3 that was oh so warmly received. Early indications are the D3S is just as hot, adding a 720p24 video mode to the mix and allowing use of the camera's full aperture and ISO range while recording. Important, that, because this camera offers a ludicrously high maximum ISO value of 102,400 -- approaching night vision territory. That's thanks to a new 12.1 megapixel sensor, which is paired with a vibration mechanism to reduce dust. How well does the sensor perform? Nobody is apparently allowed to show us just yet, but tell us they have, with words like 'simply incredible' and 'fantastic feat' used to describe its low-light shooting. Seems we'll have to wait a bit longer for full reviews, but these previews will surely whet your appetite. Oh, and the cost? A mere $5,199.95. You are lucky if you are living in the States because ZOOM has launched the Q3 Handy Video recorder in the US market. In case you didn’t know, the camcorder captures video at 640 x 480 (30fps) and records 24-bit/48 kHz audio via a pair of condenser microphones. The ZOOM Q3 needs a couple of AA batteries to operate. 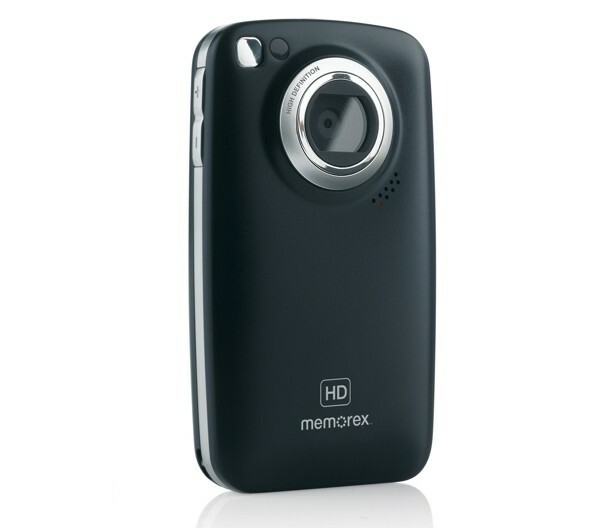 Additional features include a 2.4-inch 320 x 240 LCD display and an SDHC card slot. The ZOOM Q3 retails for $249. Flip Video just launched a new 'premium' take on the MinoHD -- it's fundamentally the same as the existing MinoHD, but with 8GB of storage, a bigger two-inch screen and an HDMI port, all wrapped up in either a sleek aluminum shell or a personalized design from the Flip website. 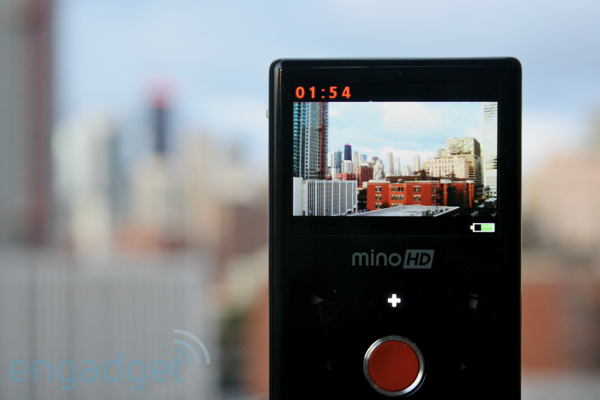 The 8GB of flash means the MinoHD can now record up to two hours of 720p video, and while there's still no image stabilizer, it's not like that's stopped anyone from loving the MinoHD before. There's also a new version of the FlipShare software, which features an automatic Magic Movie mode that'll trim and edit before shooting your video to Facebook, YouTube and MySpace. We're sure the kids will love it, but we'd rather do things the old-fashioned way. The new premium model will sell for $229, while the original MinoHD remains on sale for $199 and the old-school Mino hangs back at $149. After some time playing around with one, we'd say you're well-justified in dropping the extra $30 here -- the newer case and screen are quite nice, and HDMI-out is nothing to sneeze at. It's still the same MinoHD as far as image quality goes, however, so don't walk into this one expecting any surprises -- and no fancy al-yoo-min-ium case will quell the need for a proper stabilizer in these things. Video after the break! Sanyo has pulled the wraps off a pair of new video cameras called the VPC-HD2000A and the VPC-FH1A. The cameras are both in the Sanyo high-end Dual Cameras range and are the world’s first camcorders to offer compatibility with the iFrame video format. The iFrame format is a next generation format of video designed to allow the video to be easy to import, edit, and share. The VPC-HD2000A will sell for $599.99 and the VPC-FH1A will sell for $499.99 with both available in stores today. The iFrame format is compatible with editing applications on both Mac and Windows PCs. Video recorded on both cams is stored to SD/SDHC cards. The cameras both record in 1080i and 1080p HD formats at 60 frames per second. Resolution with the iFrame format is 960 x 540 at 30 frames per second. Both cameras can shoot 8MP still shots. The FH1A has a 3-inch LCD and the HD2000A has a 2.7-inch screen. Both sport 10x optical zoom for still shots and 16x optical zoom for video. The FH1A has HDMI out, the other cam features an HDMI cradle and an external mic input. 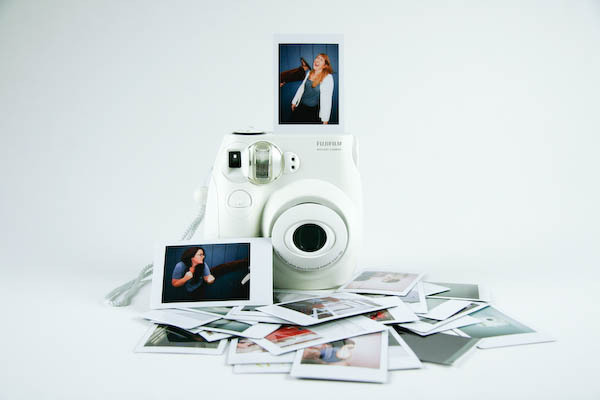 There are two ways to get instant photos from your camera: using either an instant film camera or a digicam with a built-in printer. However, there is only one way to get good instant photos, and that is still film. Without testing it, we’re not sure just how good the pictures are from Fujifilm’s new Instax Mini 7. One thing we do know is that, unless somebody has seriously messed something up (replacing the lens with an piece of beer-bottle, for example), the Mini 7 will embarrass the truly awful digital Pogo from previous instant title-holder Polaroid. The Mini 7 will remain a novelty, though, as the ISO 800, 1.8 x 2.4-inch film costs $20 for a 10-pack. 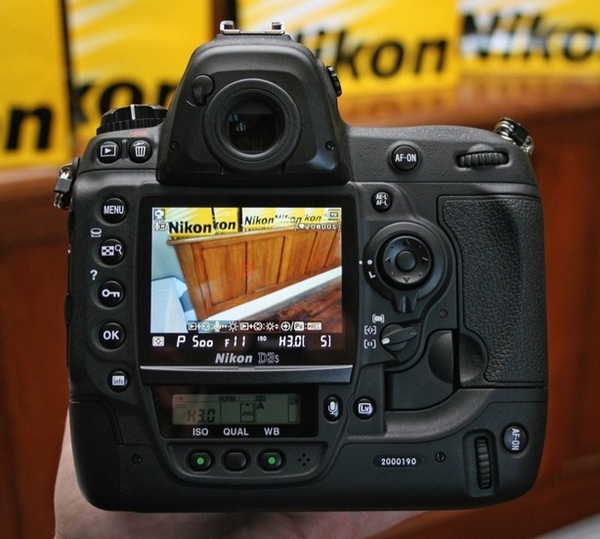 When shooting, you can pick from four exposure settings (the shutter speed remains at 1/60 sec). Focus is fixed, but when things get really dark there’s a built-in flash. The camera costs $90 and is cute enough to be given as a gift. And if experience is anything to go by, it is a gift that will be used precisely ten times, until the first roll of film runs out and it is consigned, with all the other film cameras, to the junk-drawer. Samsung has added a new color option ‘purple’ to its ultra compact HD camcorder, the HMX-U10. This new color version is available exclusively from BestBuy for a suggested retail price of $179.99. As a reminder, this pocket-sized camcorder is packed with a 1/2.3-inch CMOS sensor (10MP), a 2-inch LCD screen and offers full-HD video recording at 1920 x 1080 resolution. We already saw the Picsio GC-FM1's splashy debut for Japan, but now JVC is announcing the camera for a Stateside release. Its advertised '1080p' resolution is actually 1440 x 1080 at 30 fps, while the 1280 x 720 mode at 60 fps sounds much more enticing to us, and it's all recorded to SD card (none is included) as H.264 .MOV files. There's really not a lot to set the camera apart in a sea of pocket cams, but you can always watch the incredible all-dancing, all-crazy promo video again after the break to pique your interest. The GC-FM1 is available now for $200. Amazon has started selling a special deal on the Aiptek A-HD 720p 8MP CMOS HD camcorder for only $80. 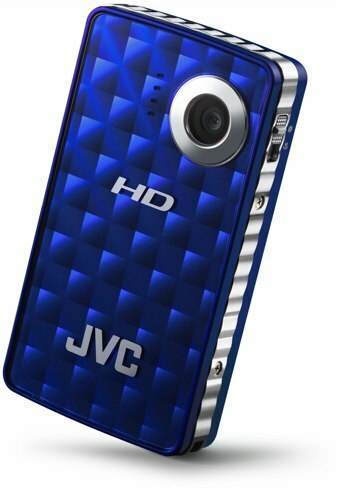 In case you didn’t know, this HD camcorder can record 1280 × 720 resolution video at 30fps (H.264). You can also connect this camcorder to any TV/VCR or DVD player to record videos, pictures and audio. Other features include a 5MP CMOS sensor, a 2X digital zoom with fixed focus, and charges via USB or AC adapter without having to remove the battery. Memorex has never exactly been one to go out on a limb with its consumer electronics, and it looks like that's especially true of its new MyVideo pocket camcorders, which the company itself doesn't even bother to go into much detail about in its press release -- other than that they'll let you 'zoom in on life's moments before they zoom out,' of course. A bit more digging turns up some expectedly standard specs, however, including 4GB of memory and an HDMI port on the MyVideo HD model and 2GB and no HDMI on the MyVideo VGA, along with a two-inch screen and the usual integrated USB connector on each. Then again, they do just cost $99.99 and $129.99, and seem like a prime candidate for discounts in the run up to the holiday season. 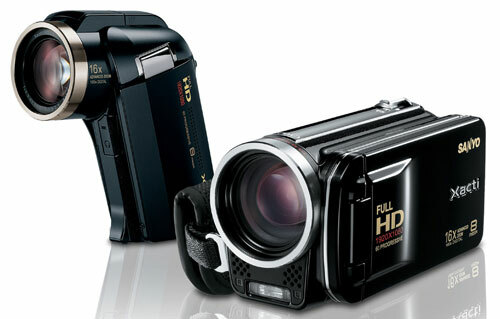 The DXG-Riviera HD is from DXG’s Luxe collection of camcorders.' It shoots 720p video onto SD cards and has a MSRP of $149.99.' There are two patterns available: the Riviera is a quilted pattern, the Soho is in an argyle pattern. Video quality in sunlight was fair.' In still camera mode, pictures were relatively clear. Check out this cool dual-function camera ‘EZ-802 EZMega Cam’ from Ezonics. 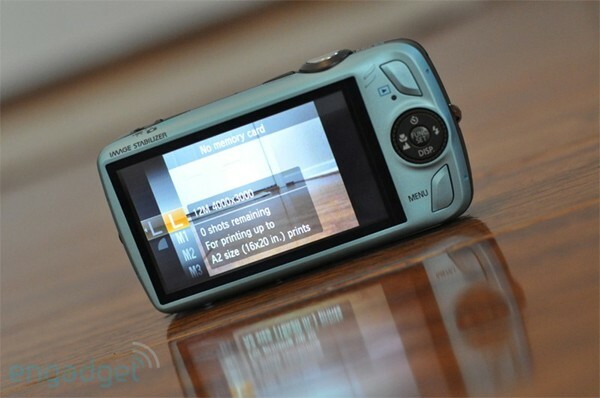 Not only it serves as a PC camera for your PC, but it also doubles as a megapixel digital camera with flash capability. This compact camera allows you to capture both full motion video in AVI format as well as digital still images in 800 x 600 resolution. It features a 0.5-megapixel CMOS sensor, an 8MB of internal memory, a USB 1.1 interface and a built-in microphone for video conference. The Ezonics EZ-802 EZMega Cam retails for $63.99. Canon held off about as long as it could, but it finally caved to the pressures of adding a pressure-sensitive screen to one of its Digital ELPHs. The SD980 IS goes down as the first-ever touchscreen PowerShot, offering a better-than-average set of specifications, a few color options, an attractive size and a 720p movie mode that helps to set it apart from some of its VGA-quality contemporaries. We took the cam for a quick spin just to see how Canon's adaptation of the touchscreen felt in real-world use, and we've posted up our impressions -- along with a few sample galleries and a raw 720p video clip -- just beyond the break.